Ever wondered where the Buffalo wings did got its name? Well it was named after the place where it was created, Buffalo, New York. Usually called buffalo wing, buffalo chicken wing or hot wing this delicious chicken pieces are deep-fried and coated in a vinegar-based cayenne pepper hot sauce and butter usually served with celery sticks and creamy blue cheese dip. This dish has a very confusing history as there are three popular stories that explains its invention in 1964, though all of the stories have the same place of origin (Anchor Bar), the stories were different. The first claim (also considered as the official story), states that it is attributed to Teressa Bellisimo the wife of the Anchor bar owner Frank Bellisimo. It is said that it was created as an easy to prepare snack for his son’s friends when one time they came home late and very hungry, Teressa needed a fast and easy snack to prepare and this was the result. Another story came from the son Dominic Bellisimo when he said it was created for Catholic patrons to enjoy a meat dish before the start of the holy week meat abstinence. It was said that one Friday night in the bar lots of customers were buying a lots drinks, it was a good business day and as a sign of good gesture he asked his mom to give out some freebies to accompany the drinks they order, Teressa Bellisimo then thought of serving chicken wings to their patrons as it was last day they can serve meat before Holy Week starts. Finally the third story coming from Frank Bellissimo. One day there was a wrong delivery of supplies, instead of the chicken backs and necks that they expected they got chicken wings. Instead of throwing them back or returning them, Frank asked Theresa to make something out of the wrong delivery. There are several more stories but they are not as interesting as the three ones, anyways they all originated from one person which is Teressa Bellisimo and it proved to be really good hence it is popular even today. It is usually served in bars and pubs but some restaurants do also serve them. A really good finger food especially for those who like it hot, a great pair with beer. Place wings in the container and cover. Shake the container to coat wings evenly. Leave chicken in the container then place in the refrigerator for an hour. Remove from refrigerator then shake the container again to make the coating thicker. Heat oil in a fryer and deep fry until chicken wings turns golden brown. While frying prepare the sauce by combining butter, hot sauce, freshly ground black pepper and garlic powder in a sauce pan. Simmer in low heat until all ingredients are mixed well. Once wings are cooked, drain in paper towel lined plate then place it on another covered container together with the sauce. Shake to evenly distribute the sauce then serve with blue cheese dip. In a bowl, mix all ingredients together until it has an even consistency. 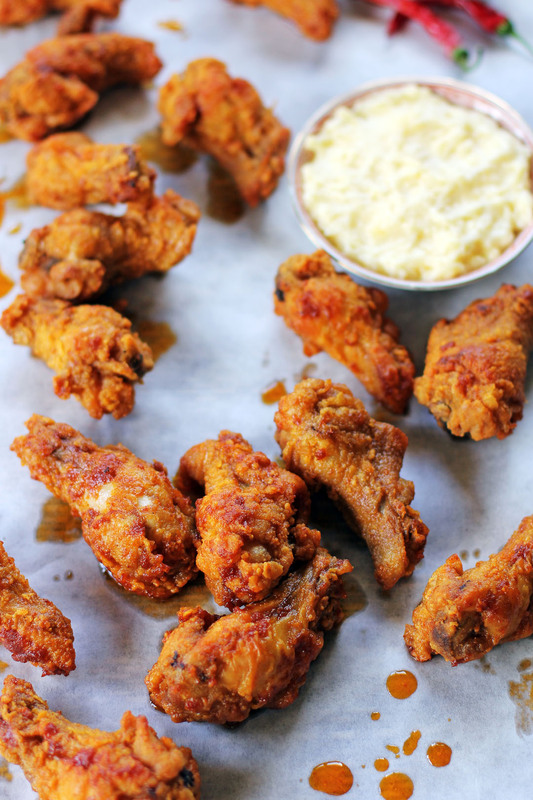 Golden brown and beyond appetizing…I’m so in love with these wings!!! Buffalo wings have never looked better. Oh your wings look so deliciously crispy ! I did not realize that there were so many stories behind the name. I had heard the one about Buffalo, NY but not the other ones. Thanks for sharing! Love those wings! I’ve been having a craving for wings for a long time now and you just made that craving even worse. However, this might just be the push I needed to make some. Thanks! These look yummy! I love, love, love these wings. Delish! These wings look perfect! And thanks for the history, I am a history buff and always find it interesting. Love the crisp on your rendition. 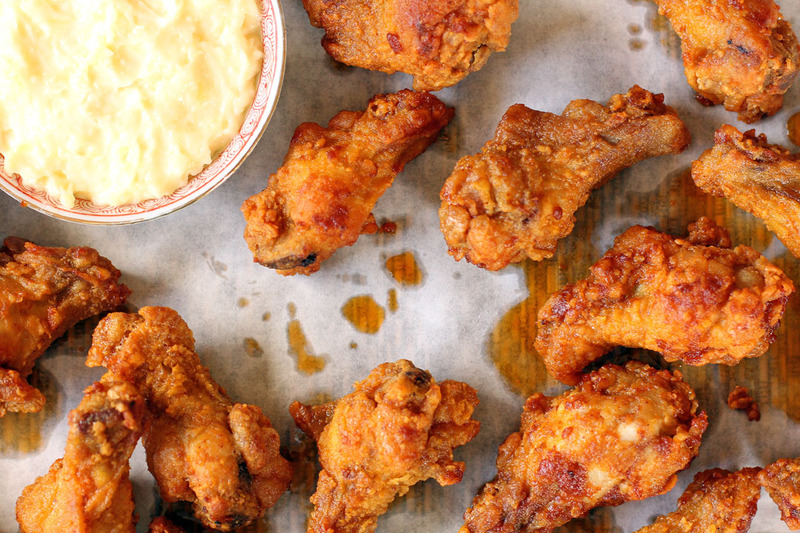 Good ole wings; you can’t go wrong with trying this recipe.